Innovative biomaterials grown from mushrooms delivering a circular, biodegradable and cruelty-free alternative to leather. 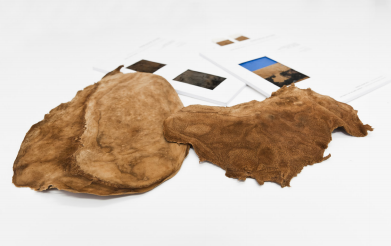 Amadou Leather™ is an award winning vegan leather solution for the fashion, furniture, automotive and transportation industries looking to incorporate low-impact materials, circular economy principles, and closed-looped systems into their supply chain. Amadou Leather™ feels like suede to touch with a natural rich brown color and a malleable surface that is lightweight and flexible. The material absorbs moisture when worn against the skin and insulates heat, yet remains breathable and cooling. The material is naturally antimicrobial as it stops the proliferation of bacteria. 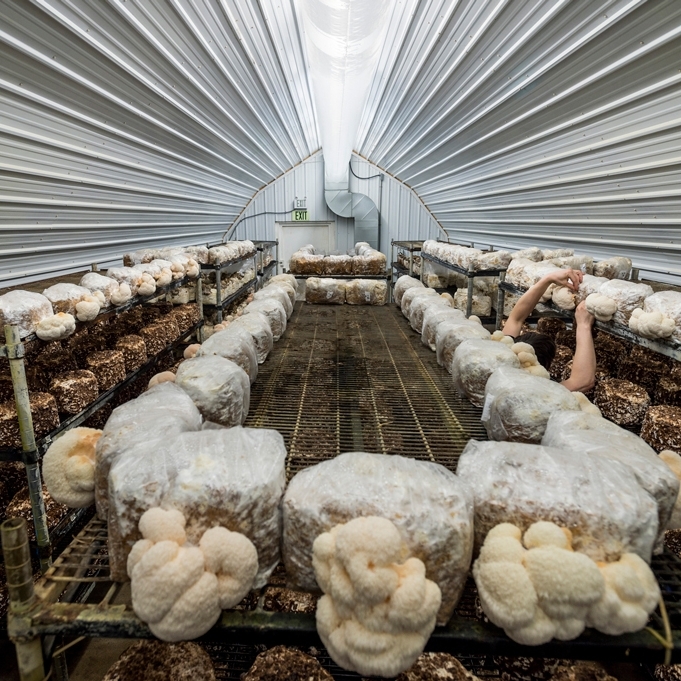 The mushroom material is grown on recycled sawdust and uses existing edible mushroom cultivation techniques. Products produced from this material are completely compostable at the end of their lifecycle, and turns soil into rich soil. who are looking for circular and animal-free solutions. The business highlights clean growth, low-carbon and circular economy, and brings innovative solutions to the fashion industry. The durability has been tested to European and International standards. We are compliant with strict internal quality tests to ensure the traceability of the whole supply chain and the compliance of the UE chemicals REACH regulation and of the ECHA list of candidate SVHC substances. The research and development conducted on Amadou Leather™, has increased tensile strength from a ‘light use’ to ‘medium use’ and the first pair of Amadou Leather™ indoor/outdoor slippers were made to confirm commercialization opportunities. 13th April 2017, Amsterdam – Fashion for Good, Plug and Play and Kering have revealed the sustainable textile start-ups awarded a place in the ‘Plug and Play – Fashion for Good’ accelerator to support the scale-up of their innovations. In today’s world we know that the way fashion is made and used will need to change. The entire fashion industry needs to become less dependent on increasingly scarce natural resources while continuing to provide a source for self-expression and create jobs, better livelihood and economic development around the world. The Change Makers Lab is one of many ways of putting this into practice and to provide a forum for the Change Makers in our industry, like yourself, to discuss, get inspired, collaborate, challenge existing ideas and myths and together move closer towards a fully sustainable fashion world. Held at London College of Fashion on Monday 14th November, Kering and Centre for Sustainable Fashion at London College of Fashion, UAL, revealed the winners of the 2016 Kering Award for Sustainable Fashion. The event at LCF gathered over 400 guests including, researchers, journalists, professionals from the fashion industry and students, around the British fashion designer Stella McCartney, guest of honour at the 2016 Kering Talk. Following an initial brief from Stella McCartney and Brioni, over 400 registrations and ten finalist projects, five students from London College of Fashion were selected as winners of the 2016 Kering Award for Sustainable Fashion: students Irene-Marie Seelig, Iciar Bravo Tomboly, and Ana Pasalic for Stella McCartney; and students Agraj Jain and Elise Comrie for Brioni. As you slip into heels or a tux to toast the New Year, you probably won’t be thinking about the fact that the leather in your shoes polluted drinking water in Indian villages, or that merino sheep were made miserable for your suit—and François-Henri Pinault doesn’t want you to have to. One of the students that won the award from Kering [at the London College of Fashion] was based on mushroom leather. Those big mushrooms that grow around trees, beautiful things—it’s a parasite, by the way. Interested in partnering or investing?